Artists are designing twelve story poles which will be carved from the 40+ lime trees that were felled to make way for the new tram route through the Meadows. The carvings will line the tram route from the top of Queen’s Walk to the river. They will illustrate the story of the Meadows community. Local residents have been involved in the process throughout. 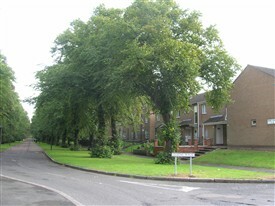 New trees will be planted in the area to replace the felled trees. The project should be completed during the Autumn of 2013. This page was added by H W on 19/09/2013.